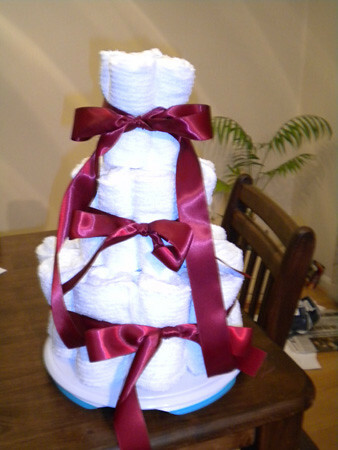 Here is my first attempt at a towel cake! The “cake” is in three pieces and I packed it in my suitcase to make the trip to Philadelphia. I have a couple of kitchen items the couple registered for (they also registered for these kitchen towels and washcloths) and I bought some Mr. & Mrs. luggage tags to add for decorations. Since I’m also co-hosting the shower, I’m a little short on money, so I had to watch it with the decorations. I wanted to give something that was useful, not terribly expensive, and would be somewhat memorable. This is going to be a decoration on one of the tables, so I’m sure people will remember it. 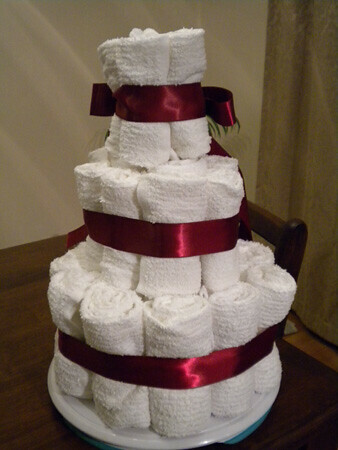 Once I have it decorated and at the shower, I’ll take photos and hopefully get them up this weekend!